Here to help your body heal itself. Dr. Pulley has years of experience evaluating each individual and finding the best personalized path of care for each patient using chiropractic, nutrition, acupuncture and Chinese medicine, or a combination of all. Her approach is gentle and her patients’ comfort is her first priority. Dr. Janine Pulley is a dually licensed chiropractor and acupuncturist; the only one in the Andover area. Chiropractic care is the adjustment and re-alignment of the spine, freeing the nervous system and increasing your body’s ability to heal naturally. Chiropractic care has been traced back to ancient Greek and Chinese texts but truly gained momentum in the United States in 1895. Acupuncture is the use of very thin needles into points all over the body to release and stimulate the body’s energy, or qi. It is the most well-known part of Traditional Chinese Medicine and has been used for over 2,500 years. After just one treatment with Advanced BioStructural CorrectionTM, you can notice immediate changes to your posture and function (such as breathing more easily/deeply). 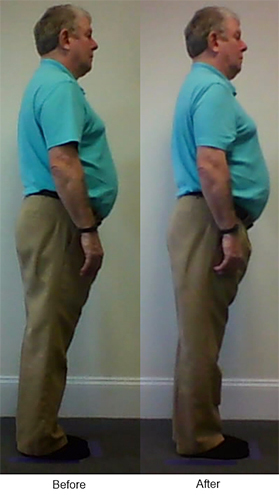 The people in these pictures were given the same instructions before and after: “breathe in, breathe out, let your body slump.” Nothing changed between the photos except having the ABCTM protocol done – their bodies are now staying upright all by themselves without any muscular effort. Could you benefit from meeting with Dr. Pulley? Call for an initial consultation today! Copyright 2014-2018 Pulley Chiropractic & Acupuncture, Inc.